John Lewis Krimmel (1786-1821) was America's first genre painter. A German immigrant who worked in Philadelphia between 1809 and 1821, Krimmel was initially influenced by David Wilkie, William Hogarth, and Benjamin West. After revisiting Europe in 1817-18, he became inspired by German romanticism and found an appreciation for French neoclassical painting. 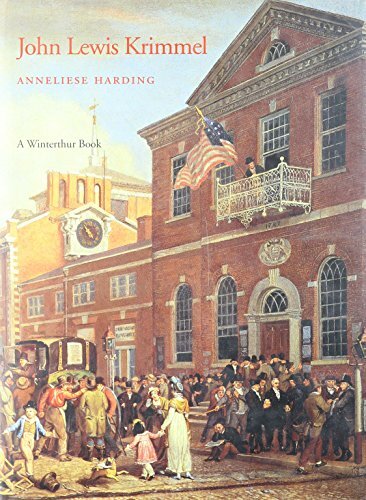 His down-to-earth, slightly jocose, and at times gently moralizing approach to painting successfully linked the neoclassicist's sense of realism and structure with the romantic's dedication to nature and humanity.<br />In this authoritative examination, author Anneliese Harding traces the development of the artist through his sketchbook images and finished oil paintings. Seven sketchbooks now in the library at Winterthur contain about seven hundred separate drawings, ranging from quick pencil sketches to finished watercolor pictures, and are the key to reconstructing Krimmel's conceptual processes. When compared to one another, they show clear distinctions in subject matter and drawing style, commensurate to the stylistic development evident in his paintings. Harding places Krimmel's specialty, genre art, in an international context by discussing his work in terms of larger stylistic trends in American and European art and defines his use of democratic and moralizing themes within the political and social changes affecting Philadelphia and the Continent. The lasting appeal of Krimmel's pictures reflects the recognition that the images present positive aspects of life with an appealing freshness and convincing authenticity.